that's a pretty dress. pretty girl too. Eid Mubarak! That could almost be a wedding dress. I like the styling masha'Allah! Assalaamu Alaikum, Eid Greetings to everyone, this picture is showing the beauty of Islam, a beautiful Muslimah, beautiful brothers and sisters in Islam embracing each other on a joyous occasion. Mashallah! What a cute expression on her face! And a beautiful outfit! Salaam, I just came across your website today. We're on the East Coast where there is such of mix of race and cultures that I sometimes feel overwhelmed by those aunties, 1st generation women, old world immigrants who have suffered in their homeland and want to vent their cultural frustrations on indigineous Muslims here. I am also a professional and sometimes it seems I am in a boat by myself (native american/black, hippie, professional free spirit but somewhat reserved-NOTE: not a niqabi). I've been near disillusionment with dealing with the masajid in the DC/VA/MD area and this gives me some hope. I believe prayer and hijab (based on belief in Allah) unites us. Thank you for showing the diversity--reminding us to keep our individuality and insha'Allah not be extreme which usually leads to being judgmental of others--we all have something we're slack in. The same mercy we show to others is the mercy Allah will grant us on youm al-qiyamah (so scary)! I forgot to say that I like this Muslimah's style! LOL. I can see the Pakistanis in the background wearing their salwar qameezes proudly and unchangeably. But, I love this girl's clothes; I think she is either Black Muslimah or from any other Islamic background, other than Pakistani because of the way she is covered which is purely Islamic and gorgeous at the same time! 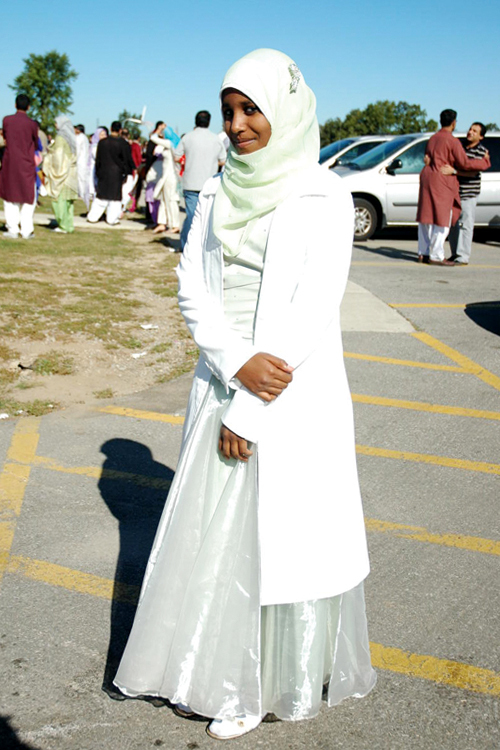 ;-))) I love this dress and it looks like a wedding dress paired with white cardi and headscarf. Absolutely something I would wear myself. ;-) Masha'Allaah.